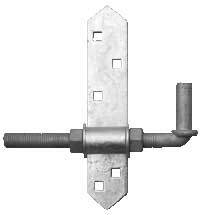 The adjustable hinge mount is mounted on the face of the post and allows for lateral adjustment of the gate. Used with the Rear Eye double straps and single straps. Fasteners NOT included. 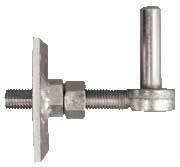 FP8256 are 3/8" Carriage Bolts, 6 1/2" long with 3/8" nut and washer - 5 pack. If fastening with carriage bolts then they should be 1" longer than the post thickness. 3/4" Threaded shaft with 2 nuts and 2 washers. Eye size - 3/4" to fit the other 3/4" Gate Hangers. Available in 4", 6", 8" or 10" lengths (measured from the center of the eye to the end of the threaded shaft. Square end prevents pin from rotating. Drill 3/4" hole in post, drive pin in and adjust to desired position by tightening the nut. Good for posts 6" 9" thick. Hot Dipped Galvanized only. For use in new construction masonry. The arms are 12" long from the center of the pin and can be bent to conform to the masonry. 9" long, 3/4" Pin with 7" of threaded shaft. This not as strong as a the Threaded Adjustable Pin but is an alternative for lighter applications. 4 1/2" threaded shaft with 3/4" eye to be used with the Pin to Screw above. By drilling a 1 1/2" deep hole, 1" diameter the pin can be adjusted back into the post and locked with the second nut. The adjustable hinge mount is mounted on the face of the post and allows for lateral adjustment of the gate. Used with the Rear Eye double straps and single straps. 24" long, made of 1/2" diameter wire and is used as an easy way to hold doors & gates open. 4 1/2" threaded shaft with 3/4" eye to be used with the 8308 Pin to Screw above.